A storm over the Tasman is bringing back the rain over Auckland. Tnks, it give me so good memory about the pass when i was studying in ACKL. Time is so fast, i have left NZ for 5 years already. 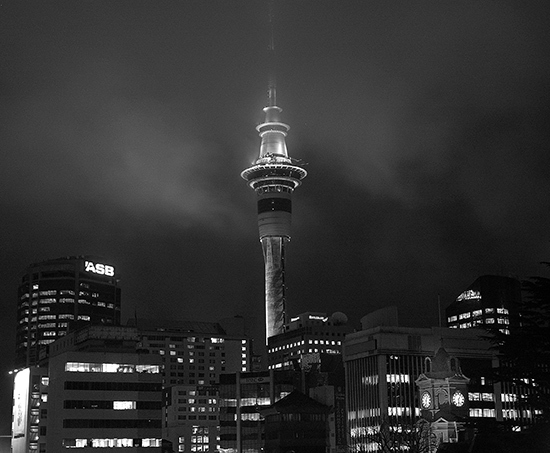 Look at the Sky Tower with Clouds around was always my strong image about the NX winter. Just excellent. Looks like a scene from a Fritz Lang movie propelled into the 21st Century, Blade Runner moved across the Pacific from L.A. to Auckland. Nothing to add on what Nathalie said… Simply wonderful ! Lachezar your photos are a feast for the eye! Yesterday’s meeting point was fun and so crisp. Some of the reflections were beautiful and even when you write ‘yet another…’ to me they are always magical.